So When Will Champions League Football Return To Stamford Bridge? Chelsea are set to be without Champions League football next season for the first time in Roman Abramovich’s 13-year reign after Zlatan Ibrahimovic sent them crashing out. It means that Chelsea, currently 10th in the Premier League and 10 points away from the top four with nine games left, must now lure a new manager knowing that a place in the Europa League is now their only realistic chance of European football next year. 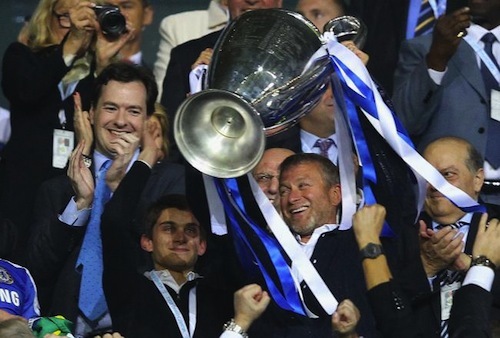 Since Abramovich, bought Chelsea in 2003, the Blues have only finished outside the top 3 once, and that was during the 2011-12 season but they qualified for Europe’s top-tier competition by beating Bayern Munich in the final. Chelsea’s best hope of playing in Europe next season is by winning the FA Cup and qualifying for next season’s Europa League. But that would be a poisoned chalice as it force Chelsea to completely rearrange their preseason plans and tour. One person who is under no illusion about how difficult it will be for Chelsea to get into the Champions League is Guus Hiddink, who calls the defending Premier League champions ‘in transition’. ‘It’s my opinion that Chelsea are in a transition period. They have to see how they go on and try and regain the lost terrain where Chelsea used to be, that’s true,’ said Hiddink. ‘It’s difficult to get into fourth position. We’ll try and do our first job, to get out of the relegation zone, but it was a very big gap to go and reach the top four and the Champions League places. This is a Chelsea team that needs overhauled. The spine of the side that has won so much over the last 13 years has gotten old and needs replaced. It’s a squad that desperately needs an infusion of young talent. With the arrival of Pep Guardiola at Man City this summer, and the expected hiring of Jose Mourinho at Old Trafford, both Manchester clubs are expected to spend around £200m this summer in the transfer market, which will dwarf what Chelsea will spend. Add in spending from Liverpool, Spurs, Arsenal, West Ham and Leicester, who could all spend over £100m and next season promises to be the most competitive ever in the Premier Leage. Abramovich will look towards current Italian manager Antonio Conte to deliver Champions football next season. Do you think he will manage it?